Holiday season is upon us, and I happen to be on a Keto diet. I don't know about you, but it's so hard sticking to the plan when everyone around me is on their third helping of pie and gearing up for 2nd Thanksgiving dinner (which is what we refer to at my house as breaking out the leftovers to make sandwiches). One thing that has helped me stick to my plan is to prepare a dessert that is Keto friendly to go along with all of the pies and other after-dinner treats. I like making mini servings so that I can take home the leftovers and store them in my freezer. This is one of my favorite Keto go-to desserts. I make it often and freeze the cheesecakes so I have a treat on hand. Place cupcake papers in a cupcake pan. Set aside. Process the above ingredients in a food processor. I use the pulse button to combine so it doesn't get over mixed. Put about 2 tablespoons of crust mixture into each of the cupcake papers and press firmly to form a crust. 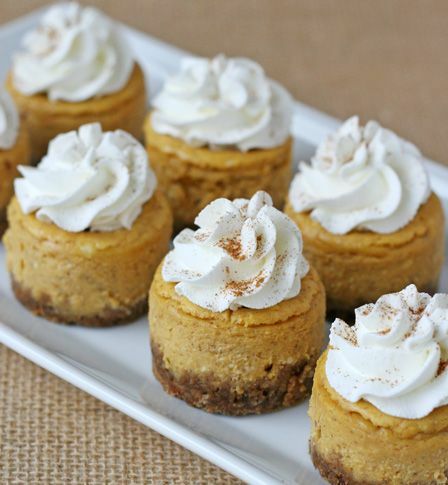 In a food processor, blend the pumpkin, sugar, cream, and spices until smooth. Before you add the eggs, taste the mixture to see if it’s spiced and sweetened to your liking. If not, add more sweetener and spices. Using the pulse button, add the eggs and pulse just until blended. Fill each cupcake tin ¾ full. Place the pan in the oven and bake for 25 minutes, then check to see that the cheesecake in the center of the tin has set. If the cheesecakes are not set, continue baking, checking every 7 minutes. Store in refrigerator until ready to serve. I like them best at room temperature, topped with whipped cream. Whip all the ingredients together to form stiff cream.